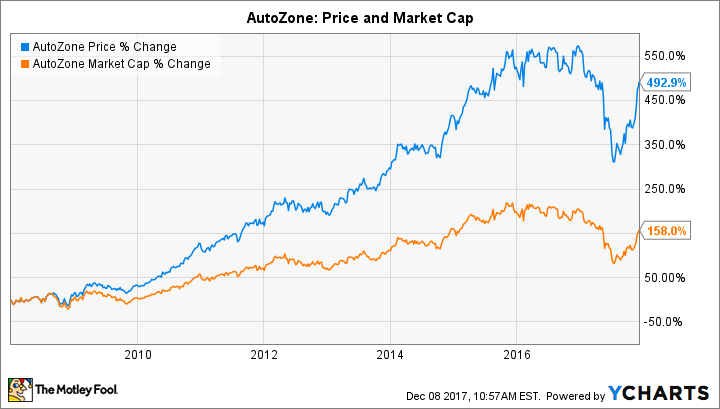 Why AutoZone Is a Top-Yielding Stock -- Without Paying a Dividend! Just because AutoZone doesn't pay a dividend doesn't mean it isn't returning cash to shareholders. Dividend stocks are great because they provide much-needed income for investors. So you might think I'm crazy to call AutoZone (NYSE: AZO), which makes no payments to shareholders at all in the form of dividends, a great dividend stock. But hear me out, because as I see it, there's more to a "dividend stock" than paying a dividend. Theoretically, it should make little difference how a company returns cash to investors. Franco Modigliani and Merton Miller, both Nobel-prize winning economists, created the dividend irrelevance theory, which found, all other factors equal, the method a company returns cash to shareholders should not matter. If a company buys back shares, it should result in an increase in proportional ownership equal to the amount of the dividend. To take advantage of the increase in value, an investor could sell off shares equal to the dividend. Admittedly, there are violations of the dividend irrelevance model's assumptions, most notably the presence of transactional costs and often different tax rates for capital gains -- particularly short-term -- and dividend payouts. However, the model provides a broad framework of thought that investors should look beyond the dividend yield when evaluating management's cash return policy. To that end, investors should also pay attention to a company's buyback yield, essentially the percentage of shares outstanding bought back in the last year. It's best to think of the buyback yield as a phantom dividend yield. And AutoZone has been one of the most aggressive share repurchasers over the last decade, choosing to buy back shares while not paying an actual cash dividend. Since 2008, AutoZone has spent approximately $12.4 billion in share buybacks. For comparison, the company has a $19 billion valuation. AutoZone decreased its shares outstanding by more than half and has never repurchased less than 5% of its shares during this period. Put more simply, if you would have owned a share of AutoZone in 2008 and held on to your investment, you would own twice as much of the company, enough to sell more than 5% of your investment annually while keeping -- and growing -- your original investment. Shares outstanding as of fiscal year-end. Data source: AutoZone's 10-K. Here's another chart that shows how buybacks have enriched AutoZone investors. Although the company has increased its market capitalization by only 158%, shareholders have seen their investment increase by 492% because of a larger ownership percentage in the company. As with dividend stocks, it's important to evaluate the company's path forward. Astute investors understand that sometimes buybacks can come at the expense of operations, as a company siphons off cash needed for the business. AutoZone has consistently exceeded its free cash flow (cash from operations minus capital expenditures) in share buybacks. In the short run, a company can use cash on hand or borrowed funds, but in the long run free cash flow must support buybacks. Second is that the company is in a tough retail environment. Until recently, the company's service and specialized knowledge prevented it from facing strong competition from e-commerce. That's now debatable, as the company posted an anemic 0.5% increase in same store sales last year. Store saturation and competition from e-commerce should be strongly considered before investing in this company at this juncture. AutoZone has been returning cash to shareholders aggressively, but if you screen only by dividend yield, you would have missed this opportunity. Don't make this mistake again; income-oriented investors should look beyond dividend yield for investments and look at total cash return. It's likely there are companies with just as generous cash return policies you're missing out on.